This fort has been used since Roman times. 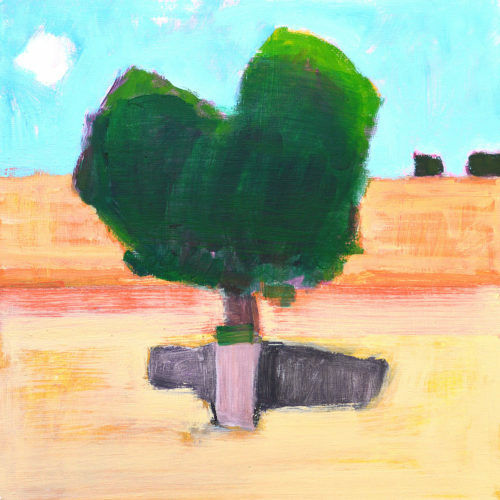 This entry was posted in Landscape Paintings and tagged 14 x 14 inches, garbage can, oil on linen on panel, spain, tree on February 15, 2019 by Kevin. 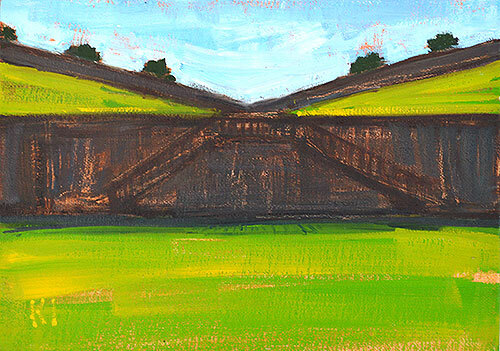 If I remember correctly, this was formerly the moat at Montjuic Castle in Barcelona. Now it’s a formal garden. 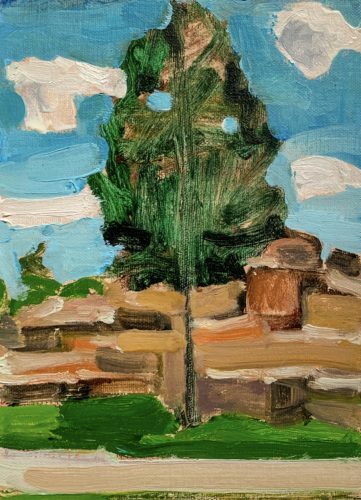 This entry was posted in Landscape Paintings and tagged 5 x 7 inches, barcelona, fort, garden, military, moat, montjuic castle, oil on linen on panel, spain on January 19, 2015 by Kevin. 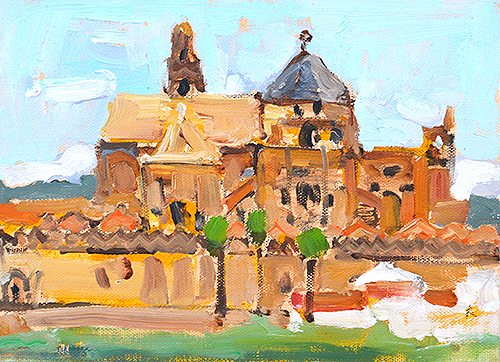 This entry was posted in Landscape Paintings, Urban Landscapes and tagged 7 x 5 inches, barcelona, cathedral, europe, oil on linen on panel, spain on January 8, 2015 by Kevin. 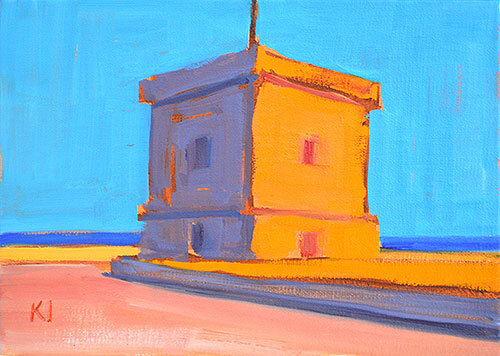 A tower at Montjuïc Castle in Barcelona. Mediterranean Sea in the background, and the port at the foot of the mountain where this castle is perched. 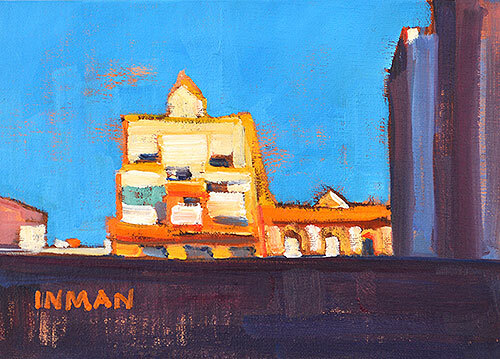 This entry was posted in Landscape Paintings, Seascape Paintings, Urban Landscapes and tagged 5 x 7 inches, barcelona, castell, catalunya, mediterranean, montjuic castle, oil on linen on panel, spain, tower on November 25, 2014 by Kevin. Home of the City Museum of Barcelona. Underneath the Plaça del Rei there are Roman ruins… I spent too much time drawing down there and couldn’t finish the history tour upstairs before the museum closed. But I successfully argued they should let me in a second day- “I thought the ticket was good for a year,” I kept repeating until they gave up and let me in. 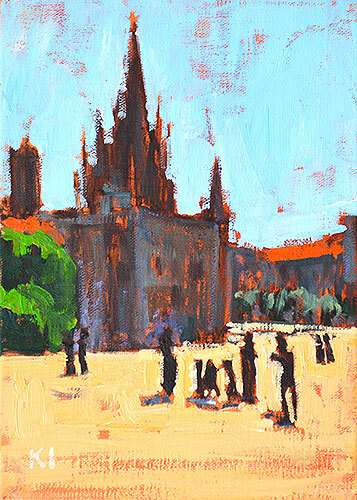 This entry was posted in Landscape Paintings, Urban Landscapes and tagged 7 x 5 inches, barcelona, cathedral, city, europe, oil on linen on panel, plaza del rey, spain, urban on November 19, 2014 by Kevin. Not sure what this place is, an attractive neoclassical court with trees planted in a pattern. Since it’s at the edge of the Ciutadella park- formally a citadel- this might be an antique building, but is quite likely a 20th century structure in a historicizing style. 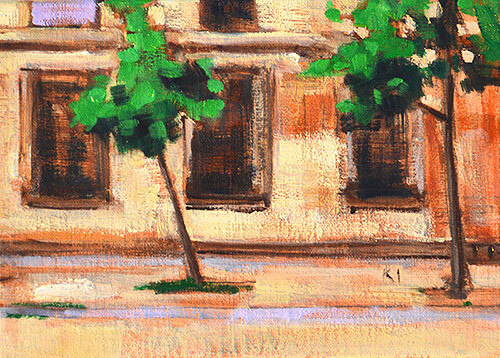 This entry was posted in Daily, Landscape Paintings, Urban Landscapes and tagged 5 x 7 inches, barcelona, ciutadella, neoclassical, oil on panel, spain on November 18, 2014 by Kevin. 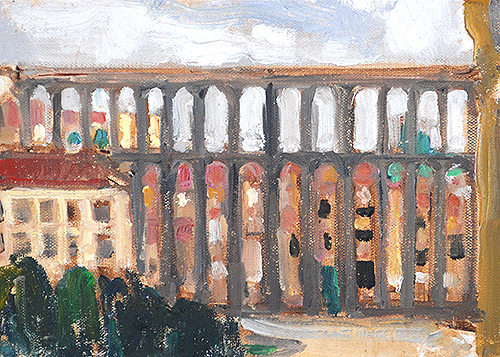 This entry was posted in Landscape Paintings, Urban Landscapes and tagged 5 x 7 inches, avinguda diagonal, barcelona, city, eixample, european painting, l'eixample, oil on linen on panel, spain, urban on November 15, 2014 by Kevin. I like scruffy places like this. 15 years ago when I lived in Spain, the old city was much grittier, and I kind of missed that. So on this trip I went looking for the areas that were more lived in and not fixed up for the tourists. 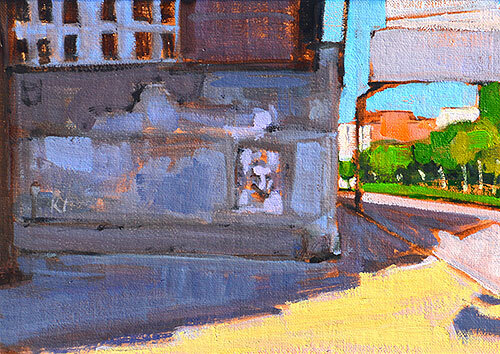 This entry was posted in Landscape Paintings, Urban Landscapes and tagged 5 x 7 inches, barcelona, city, cutout vella, oil on linen on panel, spain, urban on November 13, 2014 by Kevin. 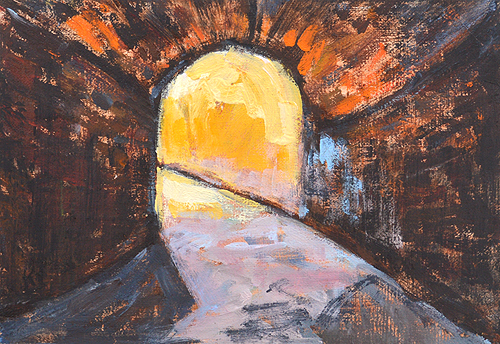 This entry was posted in Landscape Paintings and tagged 5 x 7 inches, arch, architecture, barcelona, catalonia, montjuic castle, oil on linen on panel, spain, tunnel on October 3, 2014 by Kevin. 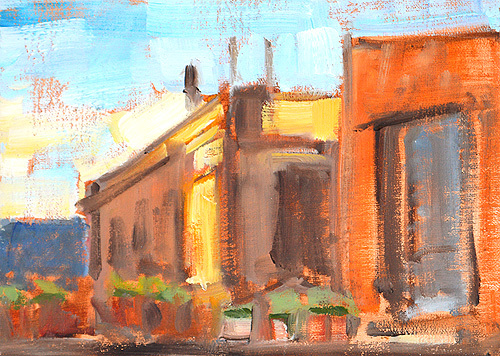 A beautiful old church in Barcelona, painted from the bar in the plaza outside. 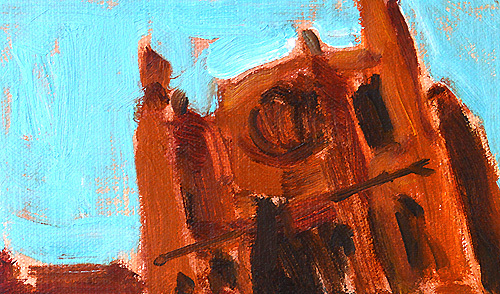 I painted Santa Maria del Mar several times, studying the changing light on the stone. 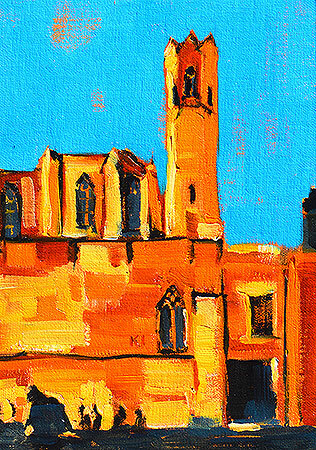 This entry was posted in Landscape Paintings, Urban Landscapes and tagged 3 x 5 inches, barcelona, oil on linen on panel, santa maria del mar, spain on September 14, 2014 by Kevin. 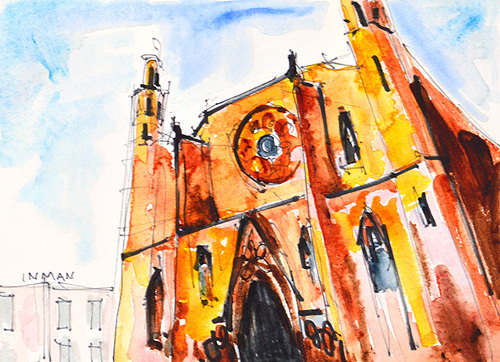 This entry was posted in Landscape Paintings, Urban Landscapes and tagged 5 x 7 inches, barcelona, cathedral of the sea, church, santa maria del mar, spain, watercolor on September 10, 2014 by Kevin.